GLOGIRLY: Win a PetBox for Your Favorite Rescue Shelter! WAFFLES: Hey Boss! Check out my new PetBox! KATIE: YOUR new PetBox? Don't you mean OUR new PetBox? ...or better yet, MY new PetBox? WAFFLES: I know, I know. What's yours is mine and what's mine is mine. Win a PetBox for Your Favorite Shelter! The nice people at PetBox are giving one of their awesome box of goodies to the rescue shelter of YOUR choice! What better way to spread some love to our furry shelter friends than with a super fun collection of toys and treats. ...not to mention a VERY nice box. Maybe the shelter kitties will have a How Many Cats Can Fit in the Box Contest! And if you're thinking you might want a box of your own, we've got a savings code for you at the bottom of the post. So What was in Our Box??? 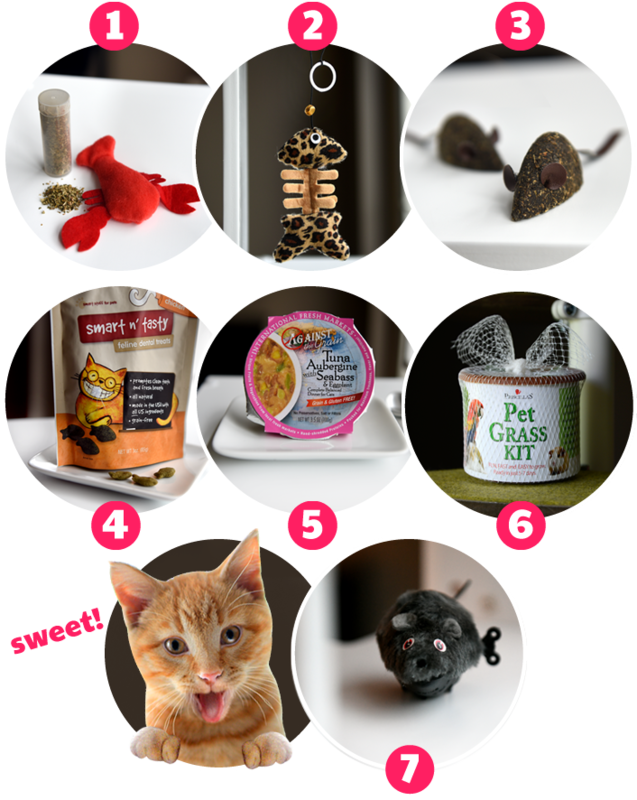 This month's box was a cornucopia (don't even try and explain that word to Waffles) of really fun toys and treats. 1. 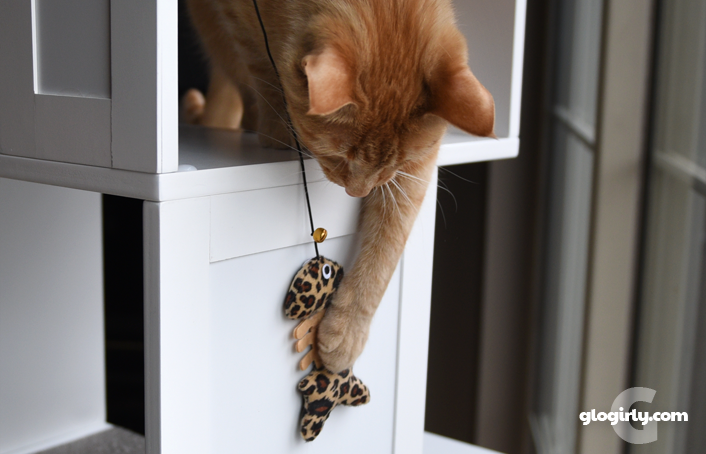 Get Crabby with Spot's refillable catnip sea creature. 2. 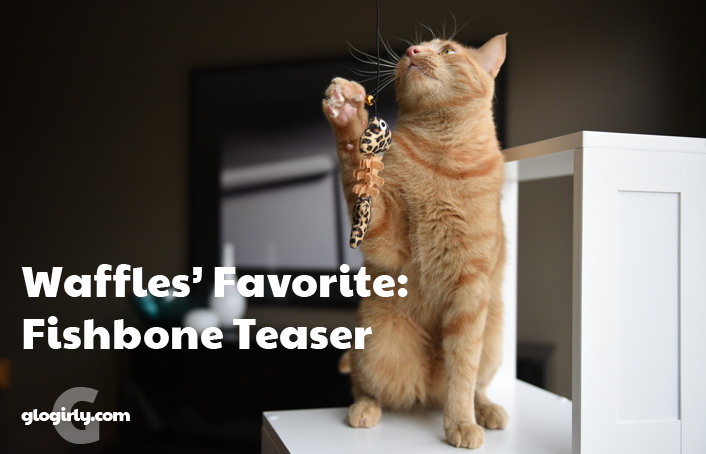 Animal print fishbone teaser from Spot. 3. Catnip Candy Mice from Spot...SWEET!!! 4. Smart n' Tasty chicken dental treats. 5. Against the Grain's Tuna Aubergine with Seabass Dinner...FANCY!!! 6. 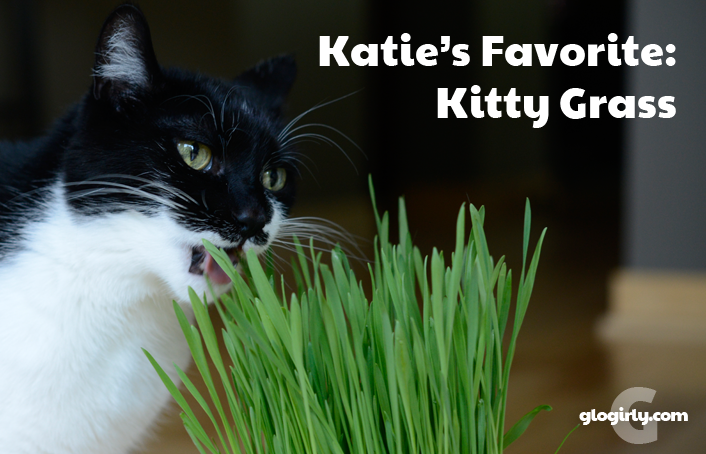 Priscilla's Kitty Grass growing kit. 7. Wind-Up Mouse from Classic. PetBox is dedicated to helping shelters and rescue organizations by partnering with them to provide needed supplies. If you are a rescue organization and would like to become an official partner of PetBox, please visit their Shelters & Rescues page to fill out a simple form. Their team will follow up with you soon. Spread the word! If you know of a shelter you think would benefit from a partnership with PetBox, please urge them to fill out the application. Every little bit helps. 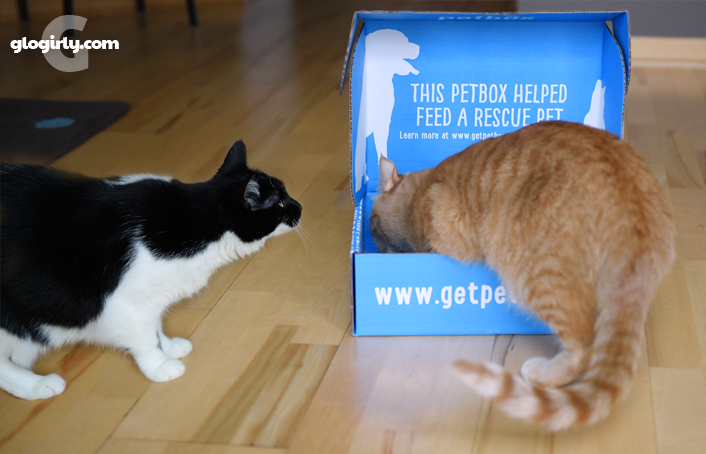 PetBox and BOGO Bowl are partners in feeding hungry dogs and cats across the country. BOGO Bowl's premium pet food is the official food for #PetBoxFridays. Every Friday on the PetBox Facebook page followers nominate a shelter or rescue that they would like to win 100lbs of dog and/or cat food. Winners are announced Monday mornings based on the organization that had the most votes from our Facebook fans. 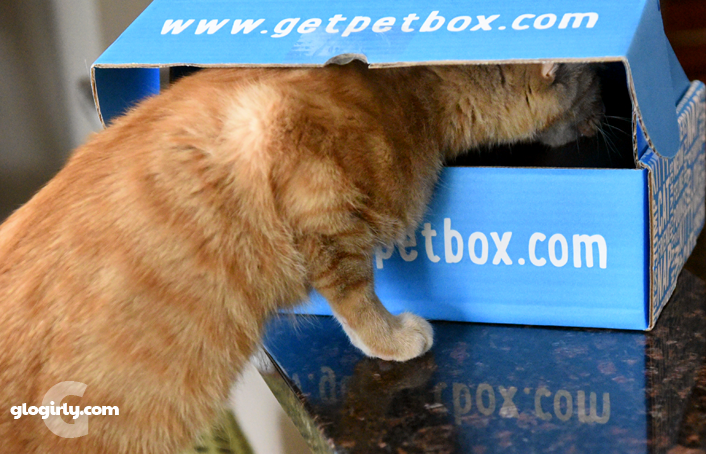 We received a complimentary PetBox to photograph and review. Though we did not receive compensation for this blog post, we do receive a small commission for any PetBox orders placed with our GLOGIRLY promo code. PetBox is also providing a box of goodies to the winning shelter. Catnip candy mice??? We *need* these! Second Chance Animal Shelter in East Brookfield, MA. They are special to me, because Me, Thumper, Starlin, Hammie and Memere's kitteh Midnight were all adopted furrom there. It is run by all volunteers who do their best to help out dogs and kittehs and people in needz of assistance with their pets. Awww, rats! Why isn't Waffles included? MOL. If we win, we'd like the PetBox to go to Cat Care Society. If I win, I'd like the PetBox to go to Kitty Bungalow here in Los Angeles - they are awesome! The Suffolk Humane Society is our shelter. Wow, what a great way to try different stuff...and help shelters too! I would send mine to PAL ( People for Animal League) in Spencer. We would send ours to The Buddy Foundation, Arlington Heights, Il. We both came from there and love help supporting them. The kitten room would really get a lot of good use out of these toys. Hey, the adult kitties would too! Dang it! Meowm and clicked the wrong button! She didn't get her rescue entered! The box does look like a wonderful bunch of goodies!!! King Street Cats, Alexandria VA - they are an all volunteer rescue/shelter. Animal Resource Network, Inc. (ARNI), P.O. Box 80376, Lansing, MI 48908. My cat Maya chose me and my parents' cat Shiimsa chose them through ARNI. Our lives have been blessed beyond measure by these two fabulous felines and ARNI deserves all thanks for rescuing them. Looks like there was enough in the box for Waffles AND Katie - even if they didn't want to share! I choose PAWS in Norwalk CT please. With over 100 cats, there are never too many toys. We nominate Elmbrook Humane Society in Brookfield WI--it's where we adopted Ringo from! They are no kill and anti-declaw/anti docking for all adopted pets! SPCA of Cincinnati, though not a true rescue they have hundreds of animals go through there doors. There animals need some fun time stuff too. We nominate the Salem Friends of Felines in Salem, Oregon. We just know the kitten room kitties and the senior room kitties would love this! My shelter is Contra Costa Humane Society in Pleasant Hill, CA and I pick them because they saved me from being killed at the county shelter. And they also made sure Sage was safe and saved her for Dad P to fall in love with. They pull all their cats and woofies from the county kill shelter and they pull mostly adult, senior and special needs. MamaJ's Stray and Feral Felines. They take in and rehome many cats and also take care of a feral colony. I just think they do great work. R.O.F.F. Rescue Our Furry Friends..is our local rescue for cats and dogs..I'm sure their kitties would enjoy it so much..Plus delivering this box of fun would give me a great excuse to visit! Oh, we would like to enter for Tabby'a Place in Ringoes, NJ. It's one of Mommy's favorite places on earth. Awesome box of toys! We would love to nominate Winnie's Wish rescue shelter!! I'm involved in a few different shelters, and while each is equally deserving of a PetBox for the animals they work with, one that focuses on cats and I feel is especially deserving of receiving this is the Furry Friends Rescue Center in SC. A dear rescue friend of mine, who I met through networking of animals on Facebook, started the rescue when she saw just how many cats were dying in shelters in NC and SC. While the dogs are in great need, too, it seemed that they already had more advocates working for their rescue. Some high-kill shelters that started with nearly 100% euthanisia rate for both dogs and cats have improved greatly on their numbers. However, a much higher percentage of cats still die compared to dogs in those states. I'm nearly 800 miles away, but do what I can to get support for my friend, Hilary, and the animals at the Furry Friends Rescue Center. The heck with the shelter catas. They get enough of my old toys and cat trees. I wanna PetBox. I love those windup toys and the canip candy mouse. I have one and used to really like it. What a wonderful thing is that pet box and to benefit a shelter too is fabulous. We like Purrfect Pals in Arlington, WA since two of our kitties came from there. Oh wow Dat's so pawsum. We hope a gweat shelter wins. What a nice thing to do. Mine would be Blind Cat Rescue. She takes in unwanted Blind Cats,FELV+,and FIV+ who otherwise would of be euthenized. They are given the best care, food, and all the love they need. Shelter From the Storm, Madison WI would love this for their kitties! We would love to win this for Midlands Humane society here in Council Bluffs Iowa! Those small mousies look nice. Small enuf for me to carry around. Oh, the box can go to my shelter, it was Derby's too. HAWS, Humane Animal Welfare Society! forgot to say that winnie's wish is in southern illinois. we traveled from sc to meet chrystal in kentucky to pick up kippie. If we win, we'd love for it to go to PAWS of Norwalk, CT.
We're embarrassed to say we're not sure about the shelters near us. We're going to start researching them more so we can help out. Oops, we didn't mention our Shelter: Angels of Assisi, Roanoke, VA. The kitties at New Rochelle Humane Society where I volunteer would love this. Animal Protection and Education Association Inc. they are one of the few no kill shelters in our area. Great Plains SPCA in Kansas city would love a box! Blind Cat Rescue and Sanctuary. Not only do they save blind cats they also save FIV and FLV. The cats have a forever home at the shelter. Alana Miller, who started Blind Cat Rescue and Santcuary is my hero and a true angel to cats.